Open Sunday Sept 13th, 1230-2pm. Perfect starter home! 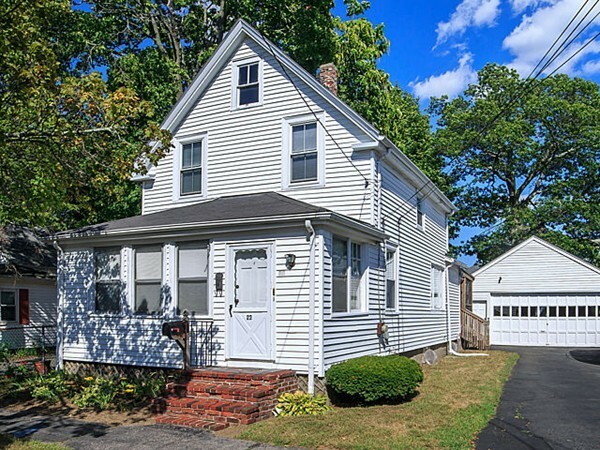 Well maintained colonial style home in desirable Riverdale neighborhood. Oversized 2 car garage is great for keeping cars out of the snow in the winter or for a mechanic or tradesperson to use as a workshop. You may be able to repurpose the space for a hobby or as a man town...the possibilities go on!!! Kitchen has been remodeled with oak wood cabinets and granite counters. 1st floor has a good size living room which opens to dining area (hardwoods under carpet). The spacious front porch has remodel potential for extra living space. 2 beds with hardwoods upstairs with small 3rd room, good for walk in closet. Bath in good shape. There is a separate storage shed for lawn equipment etc. Private, lovely screened in back deck overlooks low maintenance yard. Great neighborhood. Perfect for dog lovers. . .walk to Riverside Park on the Charles River. Riverdale elementary school is right around the corner. Your next chapter may begin here!